The son of Odin has returned, yet again, with a resounding thunderous crash but this time with a more lighthearted, warmer and almost sillier flash. 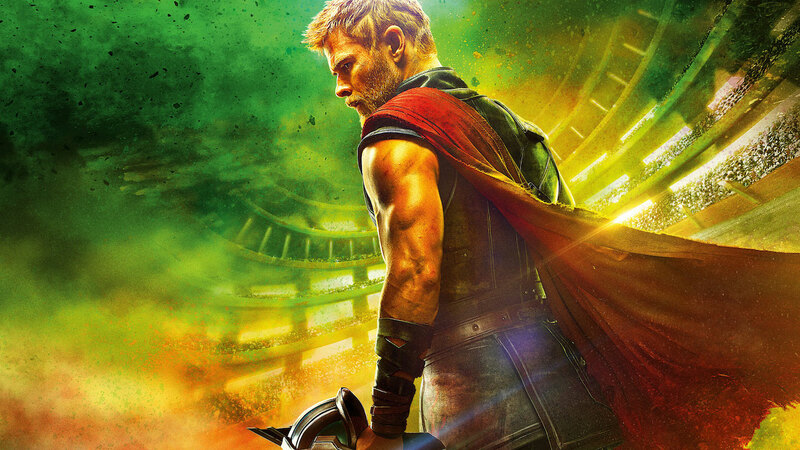 “Thor: Ragnarok” (2017) is an oddity in that, while the third sibling, it is its own standalone from its Thor predecessors. 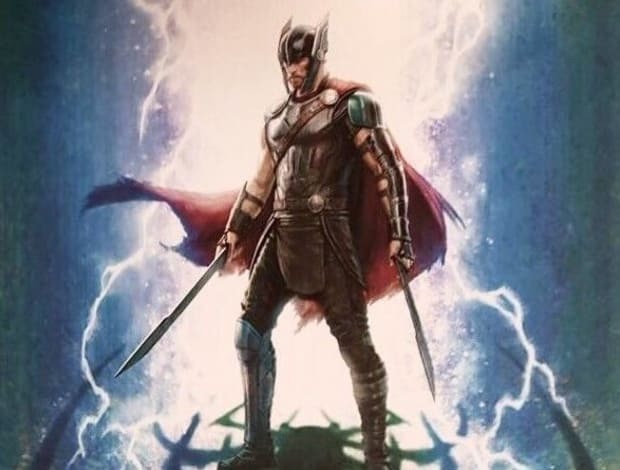 “Thor: The Dark World” (2013) was almost always too drenched in that dark emo filter that gave it its dreary tint that never fully let the piece rise up to full satisfaction, and “Thor” (2011) while very good was too distracted busying itself with laying its foundations to warrant a good enough introduction. This third son on the other hand comes out hammering. While “he” might occasionally miss your palette for overall sophistication and polish, your funny bone will not walk out of this encounter without a cast for its splinters. The premise is simple. If you’re familiar with Norse mythology, know that it’s that time when the Ragnarok (or their apocalypse) has finally arrived, and just add to that a psycho unknown sister named Hela (Cate Blanchett) who also arrives with it to take her rightful place in Asgard and then some. The story picks up just where we left off last with the last Thor movie and “Avengers: Age of Ultron” almost two years ago. Tom Hiddleston’s Loki is back, and as per usual, we are recovering again from his scheming messes – this time the banishment of Odin and his deceptive plot to rule the Kingdom under his father’s guise. As Thor (Chris Hemswoth) makes his way back to Asgard, he finds himself in for more than just dethroning Loki – if anything that would be the easier part. On his journey to ensure Asgard is not destroyed he finds himself teaming up with familiar faces such as the Hulk (Mark Ruffalo) and new faces like Valkyrie, a sultry anti-heroine skillfully played by Tessa Thompson. Something else that is nice is that the audience is saved from receiving another “this-is-how-Thor-must-grow” narrative. Instead, in this piece we receive a Thor who we feel has truly learnt some lessons off screen and matured enough for us not to have to walk with him every step of the way. Written by Eric Pearson, Craig Kyle and Christopher Yost, the opening scene gives a taste for the humor that steadily runs its enjoyable course through the movie. Thor is again seen as lovable but more self-deprecating than we’ve ever seen him before. Although, sometimes the writers could have stopped with the first slapstick and veered from repetition but it is okay – we can forgive (e.g. the chain dangling scene where he keeps turning away twice when once was funny enough). Blanchett’s Hela is a fantastic performance, so much so that I couldn’t even tell it was Blanchett in the first place except for an occasional glance. Whoever does hair and makeup over there is flawless. I keep underestimating Blanchett’s look – they seem to be reinventing her in new ways bending the laws of time and age – remember Galadriel from Lord of the Rings? Wow. But beyond her dazzling dark looks, as one would expect, she delivers well for a movie as light as this. Within the framework she’s working with she delivers to the brim. Direction by Taika Waititi is also very apt for the most part, cherry picking successful stylistic nuggets from the likes of the “Guardians of the Galaxy” (2014) which laid the gold standard for producing long action takes scored with near full-length pop/retro singles. “Thor: Ragnarok” also shows some of the same. The action sequences are what we’ve come to expect from Marvel – innovative, fast, creative and overloaded. 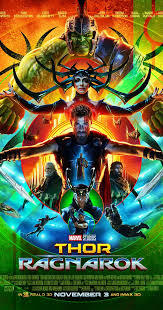 CGI comes in no short supply, but Waititi’s emphasis on retro color palettes from the 80s, and set designs and extras that look like they were yanked from extra scenes from the Star Wars franchise melting with a Crayola commercial give this movie a light vibrant feel that refrains from draining the viewer too soon. What works most well is not really the action sequences and the big budget sets – we’ve seen enough of that from other Marvel renditions and will probably get to see much more in the future (did I hear Avengers: Infinity War)—but more the onscreen chemistry of the core characters and the genuine humorous writing and anticlimaxes. Whomever Hemsworth seems to interact with turns to lovable couplings. Even from the Hulk, for instance, we get more articulate and deeper emotionally seething dialogue in Hulk form (not Bruce Banner) than we’ve ever gotten in the past. The buddy-bro relationship between them is as adorable as it is formidable. Valkyrie also gracefully avoids being the odd vulnerable girly girl left out of the boys club and instead turns it to her advantage of being a badass onscreen that’s equally funny given her own bumbling struggles. Some added story arcs are also developed for her which give her more weight and agency in the overall story, cleverly extracted by Loki’s mindreading – actually one of the more deftly and aesthetically done scenes in the whole movie. The slow-motion war of Gods scene is tantalizingly mythical and evokes a sense of that grandeur. While studded with an A-list cast, yet again we see the movie lose out on juicing that acting potency for all it’s worth. Heimdall, played by the one and only Idris Elba, gets some airtime – definitely more than usual, but still not enough to play much other than to drive the plot forward and do some cool slashes with that crazy sword. Natalie Portman who was totally written out of this movie appears not, and then of course Anthony Hopkins, our dear Odin, again left speech-less. Except for some few good liners like “Are you a God of hammers?” we didn’t see too much from him, when we could have. Overall, “Thor: Ragnarok” is a piece that comes together to please and satisfy nicely. Surprisingly funny, and charged with all the action you would expect and I think you would want, the movie will be a safe watch for this fall season. If anything, it’ll wet your taste buds for what’s to come. We give it a solid 8.4/10. Adieu. Wait, what? Action movies? Are you serious? Sure, what's wrong with a cool action flick the entire family can enjoy, right? Well, therein lies the biggest issue with most action movies – they aren't very family genre..